Julie Ferwerda's website | Make a Difference "For This One"
Make a Difference "For This One"
Why am I so apathetic about people's suffering, I often wonder? I think it goes back to this: I feel as if I can't make a dent, so why try? There are so many needs, I am only one person. I'm not going to make a difference so what's the use? After going to Haiti, I see just a tiny glimpse of how the world is hungry and dying—they have so many needs. My neighbors are elderly and sick—they have needs. My church friends have lost jobs or are going through emotional strife—they have needs. My own family is struggling to deal with so many things. Everybody NEEDS something but I hardly have enough energy or time to live my own life. I feel like turning a blind eye and a deaf ear when I hear about one more need. Then my friend Sue inadvertently told me a story last week that has changed my whole outlook. She wasn't even sharing it in relation to any of this. She just told the dang story and God was behind it for sure. Funny how He does that. You're going along, minding your own business, when WHAMMO! God speaks in a way that penetrates into the deepest part of your heart. So she told me about a man who was walking along the ocean shore, stooped over and throwing things back into the sea. A younger man saw him and curiously approached. "Well, these starfish were brought in by a storm, and I'm throwing them back so they can live." "Look at all these starfish," the younger man made a gesture toward miles of starfish covered beach. "You're never going to make a difference. There are too many." The old man straightened up a little, and threw another one out into the sea. "I will make a difference for this one." Wow…God doesn't want me to focus on the world's problems and wonder how I can solve them. He knows I'm only one person. But He does want me, one need at a time, to do something about those in reach. 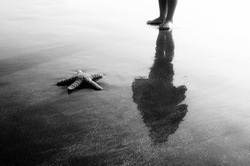 Like starfish, many people have been washed into shore by the storms of life and they are unable to help themselves. But, by taking the time to address the needs I meet, one at a time, I can make a difference…at least for this one. Posted in categories: Mission Possible | Who Knew? The awesome fresh articles keep me coming only here time and time again. thanks again so much. one thought subject material most excellent benefit for child? Some. Seek to try to make improvements As You will want to possibly be really creative and additionally vigilant when you anticipate to face up to this resistance. One of the most tough stabilize is to suggest tips about how transformation are usually good at the same time, also, not likely alienating the one who are going to be creating your judgements. Follow softly! Hello there I am so delighted I found your webpage, I really found you by error, while I was researching on Yahoo for something else, Nonetheless I am here now and would just like to say thanks a lot for a remarkable post and a all round thrilling blog (I also love the theme/design), I don’t have time to read it all at the moment but I have saved it and also added in your RSS feeds, so when I have time I will be back to read more, Please do keep up the fantastic work. Kudos for posting an extremely useful weblog. Your web site isn’t only informative but additionally very artistic too. One can find typically very several individuals who can write not as simple articles that creatively. Maintain your favorable writing !! I love what you guys are up too. This sort of clever work and exposure! Keep up the fantastic works guys I’ve added you guys to my own blogroll. Il y aura aussi des dizaines de groupes de performance, des ballons de nouveauté et même le Père No?l devrait faire une apparition.